However you listen to your mp3s you are reliant either on the internal music tags of the file organisation of the music collection. Most music lovers have both tags and the files organised on disk. This duplication means the tags and file structures should be synchronised, ideally automatically. Most digital music lovers use internal music tags. These are sometimes called metadata or ID3 tags (in the case of mp3s). 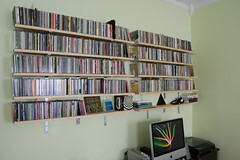 Tagging gives the most flexibility in organising your music collection. You can have multiple tag types, such as genre, year of release, record label and so on. You can have multiple values too. You can also organise your mp3s by folders on your computer's hard disk. Typically you organise by artist and album but there are many possibilities. If you store tags and you organise your music on hard disk, as most people do, you have duplication of album name, artist name and other tags because these tag values appear in both the file or directory name and internally within the tags. The danger of duplication is that if the duplicated items become out of sync, the same music can be referred to by different names. For instance, imagine you purchase The Beatles by The Beatles (commonly known as The White Album on account of its white cover art). Initially, this is tagged colloquially as 'The White Album', perhaps because you tagged it yourself or the information was downloaded by a CD ripper from FreeDB. The files, therefore, are organised in a 'White Album' directory. Later you decide to give the album its official name so you re-tag it 'The Beatles'. What happens to the directory? It must be renamed, otherwise directory listings will give a different list of albums to your music player(s). This will cause confusion later on. Correct the differences yourself manually. Use a file explorer or the command line to change the file or folder names that need synchronising. Correcting the file organisation yourself is an easy way but you must remember to do it each time you make a change. If you don't, it's easy to forget how directory and names relate to tagged music. Use software to semi-automate the process. Examples are Tag&Rename, MP3Tag and MediaMonkey. They are semi-automated, in that you must load them up and tell them to synchronise, specifying how to synchronise. You must remember how you did it last time so you have a consistent approach. Fully automate the process using software. By defining how you want files organised declaratively in a rule, software can observe when music tags have been changed and automatically correct the file organisation. The same rule can also be applied in reverse: change the filename, and so update the tag. This declarative approach is the one bliss espouses. Remember to keep your tags and filenames in sync! Thanks to Justin and Elise for the image above.